FILE – In this Jan. 10, 2016, file photo, a U.S. Air Force B-52 bomber flies over Osan Air Base in Pyeongtaek, South Korea. 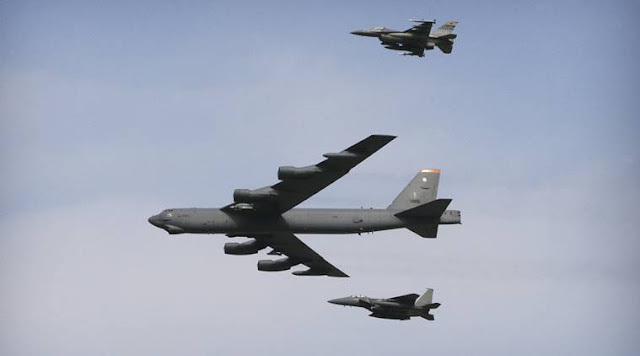 SEOUL, South Korea — South Korea says the U.S. military has flown powerful bombers and stealth jets over the Korean Peninsula in joint drills with South Korean warplanes. The United States often sends such high-tech, powerful aircraft in a show of force in times of heightened animosities with North Korea. Monday’s flyovers came three days after North Korea fired an intermediate-range missile over Japan into the northern Pacific Ocean in apparent defiance of U.S.-led international pressure on the country. The North conducted its sixth nuclear test on Sept. 3 and was subsequently hit with tough, fresh U.N. sanctions. Seoul’s Defense Ministry says two B-1Bs and four F-35Bs conducted drills with four South Korean F-15K fighter jets. South Korea says the U.S. military has flown powerful bombers and stealth jets over the Korean Peninsula in joint drills with South Korean warplanes. The United States often sends such high-tech, powerful aircraft in a show of force in times of heightened animosities with North Korea.